Since we've left Puerto Vallerta, we've visited a diverse variety of coastal towns and beaches. Sand varies from golden honey to black volcanic, and the drive south on Highway 200 winds through jungle covered hills looking down on empty palm lined beaches. However, as it is the off-season, many of the small coastal towns are mostly closed as they await the more profitable onslaught of tourists beginning in November. It had a great beach, good roads, and cute shops, but again was still largely hibernating until November. I did finally get my hair cut by Javier (from Santa Barbara CA), who was living in a small home next to the campground we selected. The setting was quite rustic, but beautiful. Chris managed to be the only person surfing the whole beach and ended up getting extremely thrashed by the overhead waves. We pampered ourselves after the hot, breezeless night we spent camping in San Juan de Alima by renting a beautiful Asian-themed two story palapa, or thatched roof shelter, in Barra de Nexpa for an evening. The outdoor kitchen was a great spot to sit and watch chickens. The next day we stopped just north of Zihuatenejo in Trocones. We are staying at Bungalows las Palmitas, owned by Bruce, a surfboard shaper and artist. The plan after this is to head to Acapulco, spend a night in one of the mega resorts there, and then drive back inland for some different scenery. Taxco, Pueblo, and Oaxaca are next on the list. We arrived in Durango Monday afternoon tired from three nights of sleep deprivation in Zacatacas. Dishearteningly, it was even colder and rainier in Durango, so we treated ourselves to a hotel with cable TV so we could veg out in comfort for the night. Durango had a very pretty square, fronted with a church, surrounded by stores (including the nicest McDonalds you can possibly imagine), and contained a picturesque gazebo in the middle. It seemed in general like a nice city, but we were ready at that point for some beaches and warm weather. We did have the feeling (similar to one I often had in San Francisco, in July, when I was wearing my winter coat and shivering) that we may never be hot again. We left for Mazatlan on Tuesday morning, on a road called the Espinazo del Diablo, or the Spine of the Devil. The road climbed steadily up through rolling hills and countryside decorated with beautiful wildflowers. For several hours it wound through vertical cliff walls and sheer drop offs. Luckily the direction we were traveling was on the inside of the road for almost the whole drive. The views from the roadside were spectacular with vistas of steep mountain ranges to the horizon. The environment changed dramatically from alpine to tropical when we started descending down the Western slope. Pine tree were replaced with palm trees, and the vegetation became lush and green. The New Hotel del Rio, a half constructed hotel, served as our home in Mazatlan for the next two nights. The bottom floor was completely finished; the lobby and upstairs rooms were being worked on. It was close to Viejo Mazatlan, the old section of town, which was quite pretty with small garden squares, old churches, artisans’ shops, and colonial style architecture. We enjoyed a nice day on the beach of Isla de la Piedro, or Stone Island after Rob, an musican who moved to Mazatlan from San Diego listed it as a place to check out . Apparently this is where they film Corona advertisements. There are many palapas, palm thatched roof restaurants, lining the beach, and warm water with gentle waves. After finding a great location with our own personal tiki hut and friendly staff to keep us from getting too thirsty, we spent the day swimming, eating, playing chess, and relaxing. We headed back to Viejo Mazatlan that evening for a great performance at Teatro Angela Peralta, a beautiful theater built in 1860 that had recently been restored. The night started with opera, and ended with some fantastic mariachi music. The audience was singing along to what obviously were famous traditional Mexican songs. Upon heading out of Mazatlan, we decided to take a quick detour through El Zona Dorada, the Gold Zone, where more of the tourists tend to spend their time in the city. While there were several official Senor Frogs stores and a Starbucks, we were generally unimpressed and glad that we had spent our time in Viejo Mazatlan. Our plan was to spend the next couple of days in San Blas, a smaller town on the coast known for its surfing. However, we were pretty unimpressed when we arrived. We were also fearful of the warnings in several books about the jejenes, or sand flies that feast on human flesh during sunset and sunrise. We therefore continued on to Chacala, a very small town further south down the coast. It had one main street with a couple of smaller cobblestone streets off to the side, and was almost deserted. We camped on the beach and fled early the next morning, chased away by the jejenes we tried to avoid. Chacala is described as ‘undiscovered’ in the Lonely Planet guides. After experience there and being inimpressed by San Blas we headed for the slightly more discovered small town of Sayulita. When getting ready to leave Real de Catorce, we became concerned about finding someplace to sleep in Zacatecas. We didn’t know that El Grito, or Cry for Independence, is September 15. 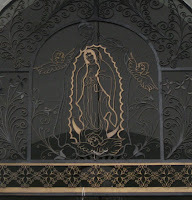 This commemorates the 1810 Grito de Dolores issued by priest Miguel Hidalgo y Costilla calling for rebellion against the Spanish colonial authority. While this did start years of rebellion culminating in Mexican independence in 1822, things didn’t end as well for Hidalgo, as he was captured, executed, and his head put on display for ten years as a warning to other rebels. This day is a huge celebration in Mexico (much bigger than Cinco de Mayo), and many people head to the cities to drink, eat, dance, party, and fill up all available camping and hotel rooms weeks ahead of time. After a somewhat embarrassing and unsuccessful attempt to make a reservation by phone, we decided it would be easier to find a place to stay once we got into town. Worst case scenario we’d have to stay in a smaller city outside of Zacatecas where there would be more availability. We did, however, pass up the first RV camping option we found outside of town. Although 50 pesos ($5) can’t be beat, we weren’t so sure about the herd of goats. On Saturday September 13 we managed to navigate the narrow, steep, and winding streets of Zacatecas to arrive at the peak of Cerro de Grillo, one of the three mountains that surround the city. Unfortunately, the only available room we could find was at one of the most expensive hotels in the city. We decided to stay there just for the night so we could see some of the city that afternoon. Zacatecas is a beautiful old colonial city, with very few foreign tourists. It reminded us of San Francisco for several reasons: it sprawls over several impressive hills, boasts many excellent culinary options, has narrow streets that become so steep they evolve into pedestrian steps, and at an elevation of 8000 feet, is quite cool and foggy. We spent our first night in the lap of luxury, with cable TV (we especially enjoyed the cartoon network en espanol), our own bathroom, drinkable water, and a bed. Whereas in Real de Catorce, we were awakened in the morning by crowing roosters and braying burros, in Zacatecas we were kept awake by roving bands of drummers and trumpeters, and random bursts of fireworks. On Sunday we wandered the city, admiring its cathedrals and squares, and luckily stumbled upon a hostel that had a room available for the next two nights. While clean and conveniently located, the room furnished only with a bed and the shared bathroom was quite a different experience than our previous lodging. But you can’t beat two nights for $40. Sunday we continued our wandering, sampling the local cuisine, including the very strange but tasty tamarind candy, which was a bean pod soaked in tamarind spices (seeds not edible), bierria (lamb), drinking cervezas, window shopping, chatting with the locals (at least those who wanted to practice their English), and touring the old silver mine, Mina El Eden. This tour was probably quite informative, but as it was en espanol, most of the details were lost on us. From our guidebook, we do know that this mine was operated from 1586 until 1950, and at one point the mines of the state of Zacatecas were producing 20% of Mexico’s silver (mostly for the benefit of the Spanish Empire). Monday we celebrated El Grito. The main streets in Zacatecas were shut down to pedestrian traffic and vendors selling food, sombreros, scarves, mustaches, beads, and numerous other trinkets containing the colors of the Mexican flag. We followed the sound of gunfire across town to see a reenactment of a famous battle for independence on the Cerro del Buffo. We tried to keep our distance from anyone firing blanks after having one go off next to us that was so loud we could feel the explosion. After our hearing came back a group of the re-enactors let us take pictures of them and then offered us sips of their mexcal. Mexcal is a surprisingly smooth drink which like tequila, is made from agave. We then headed down the hill to the historical main plaza for mariachi music, dancing, and the craziest urban fireworks display we have ever seen. We tried to capture the feel these two days of celebration with this video, but it doesn’t do it justice. After meeting three friendly Mexicans, a professional photographer, an assistant professor of mathematics, and a software developer in the plaza we joined them at a local bar to chat. Chris then continued the party at the local fair while Kristin tried to sleep through the fireworks. We are heading through Durango on our way to Mazatlan on the Pacific coast next. We left Potrero Chico on September 11th to drive to Real de Catorce, a former silver mining town isolated high in the Sierre Madre Oriental mountains. After dropping Lisa off in Matehuala , we drove west into the desesrt filled with Joshua trees and crumbling adobe buildings. In the middle of this deserted landscape, we were suprised to turn onto a cobblestone road heading off to the horizon (video here). We drove over an hour through the desert landscape on this cobblestone road, rarely encountering any signs of human presence except for a group of people hacking at a hillside with pick axes. The road climbed up the hillside (still cobblestone), passing a large amount of stone ruins before arriving at the entrance to a narrow one lane tunnel (once again cobblestone, of course) cutting through the mountainside. The tunnel contained a shrine near the entrance, we hoped it would help us make it through safely. We stayed at Hostal Alcazaba which had camping spots in a garden conveniently across from an old spooky church, graveyard, and abandoned bull fighting ring. The last stretch of the road was very muddy, as the cobblestone road was in the process of being restored by hand. Real de Catorce was once a wealthy Spanish mining town founded in the mid 1700s. By the late 1800s the town produced 3 million dollars of sliver a year. The town became a ghost town in the early 1900s with only a few hundred people living among the ruins. Today the town is coming alive due to tourism, with stores containing native Huichol art and restaurants specializing in Italian foods. We took a horseback ride from the center of town to the Pueblo Fantasmo, a ghost town on the top of the hill. We got a lot of practice speaking Spanish with the guide. He spent the whole ride up the hill trying to convince us to take a trek into the desert to pick peyote, or at least that is what we think he was trying to accomplish. On the top of the hill, our guide dropped a rock down one of the open ventilation shafts of the abandoned mine, and it took around seven seconds for it to hit the bottom. We also met Angelika, Dario, and Marko, a group of friendly Austrians who invited us to join them for lunch when we returned. We had lunch at a great restaurant, and found out that they started www.chexpedia.net, a project to bring needed school supplies to Cuban children. Our next destination is Zacatecas, another silver mining town on our way to the Pacific coast. We have now been in Mexico for over a week, and have enjoyed the beautiful scenery, tasty food, and friendly people. After crossing the Mexican-US border in McAllen Texas on September 8, it took us about an hour (with the help of a friendly Mexican tourist who spoke English) to receive our tourist cards and vehicle import permit. Being unseasoned travelers, we decided to take the toll roads from Reynosa to Monterrey. These perfectly maintained cuenta roads felt like an USA freeway, except that they were almost deserted. We quickly realized why they were deserted after paying our first toll of $18. After several more tolls, we arrived in Monterrey and drove an hour northwest to Hidalgo. Potrero Chico is a park on the west side of Hidalgo, and is renowned for its rock climbing. We camped for $10 a night at Posada Potrero Chico, a central location for rock climbers. We arrived about a month before the season begins, so we had the whole place to ourselves for a couple of days, before sharing the place with Lisa, a friendly Austrian. The day we arrived we asked for a guide and equipment rental, and our hourly updates from the friendly staff were that something would be arranged manana. Lisa and I managed to get a couple of climbs in on the last day, but spent most of the time relaxing, hiking, and studying Spanish. We particularly entertained by a wild chiva hunt. Four men arrived in a pickup truck one afternoon and asked Alex the manager if they could pass through their land in order to catch a wild white goat that has been roaming the hillside for the last couple of years. We watched the men through our binoculars spend an hour of grueling uphill scrambling through the brush attempting to surround the sleeping chiva blanca. When they got close, la chiva calmly awoke, and gracefully escaped up the steep hill. Alex and the staff enjoyed seeing la chiva in the hills, so they misdirected the hunters for another grueling hour in the hopes that would convince them not to re-attempt this hunt. When Chris and I really got serious about planning this trip, we took some easy steps to help us save more money. Key to this plan was cooking at home. Before embarking on this plan, we would typically go out to eat at a number of our favorite restaurants in Mill Valley - sushi, gourmet burgers, Indian burritos, Italian - about 4 times a week, and we think we'd average about $40 per meal. And even under our new plan, we still would often be lazy and shop at the very nice but very expensive local grocery store a block from our apartment. However, now that we have been gainfully unemployed for 2 months and are no longer living off the good will of family, we are being even more careful with our food allowance. For the last 3 days, we have averaged about $4 for dinner, including our choice of tasty beverages. For example, tonight we are staying at the lovely Mission Bell RV resort, complete with saltwater pool, jacuzzi, shuffleboard, and horse shoes for $26. A little rich for our tastes, but we're right on the border of Mexico and RV resorts seem to be the only camping options. For dinner we had tasty chicken and dumplings with peas and carrots, a Hostess-like dessert, and the champagne of beers. Once we leave the US, we don't imagine there will be such cushy RV resorts very often in our future, but last night's camping experience will probably more closely resemble our camping options (we hope!). We drove our car out onto the beach on Mustang Island, on the Gulf of Mexico, and were lulled to sleep by the gentle sound of the ocean. We'll find out tomorrow as we will be crossing the border into Mexico for several nights of camping in Monterrey. We have gotten a couple of requests for videos of the Ecamper from people interested in learning more about it, so here it is (also posted on YouTube) - enjoy. We're finally getting close to heading for the border. We are hanging out with Cornelius' parents in Florida for a couple of extra days as we wait for Gustav to finish with the Gulf Coast. To get ready for our trip, we made a bunch of modifications to Caballo (besides adding the ECamper camper top), thanks to the helpful posts at Honda Element Owners Club Forums. Some were simply cosmetic: we didn't opt for the fog lights, but Chris thought the empty spaces left in the front bumper for the fog lights looked funny so he installed 3/4" mirrors in their places. Other modifications were functional: the radiator is pretty exposed in the front of the Element, so we installed a black plastic gutter guard, attached with black zipties behind the front grill to protect the radiator. This is called the Home Depot Grill Guard Modification on the forums. Additionally, we installed LEDs in the dome and map lights to minimize drain on the battery. We opted for a blue LED for the passenger side map light to minimize distraction to the drive while the passenger is navigating. Once again, check out the A new type of LED dome light post on the user forums. The hardest part of the whole thing was figuring out how to order the right LEDs from www.superbrightleds.com. This site is great- I bought a cigarette lighter flashlight from the site along with my LEDs, and it did not fit in the cigarette lighter of the car. I sent it back and they refunded my money. Lastly, we made improvements to make the car more comfortable. With much encouragement, assistance, and collaboration with my mother, we impressed ourselves by sewing curtains for the car. Emboldened by this success, we then sewed screens for the front windows to keep out the bugs. The curtains are suspended on poly drapery cord strung between the various handles, hooks, and seatbelts around the interior of the Element. The side curtains don't need to be taken down to drive the car, as they can be gathered at the frames between the door. The front and rear curtains can be easily put up and down as they are hung using mini carabiners through grommets in the curtains (brief video on YouTube or below). Grommet-carabiners attach the rear curtain to the hooks by the rear door, and by zipties around the rear seatbelts. The front curtain is strung in a similar fashion between the two handles above the front doors, and I put some velcro tabs at the edges of the front, side, and rear curtains so they can be non-permanently attached together to mamimize coverage. For the window screens, I bought mosquito netting from EMS, and elastic drawstring, large beads, and cord locks at the West Concord 5 and 10, the local Concord Massachusetts general store. The screens fit over the open front door and can be cinched tight once the door is shut to form a closer seal. Once we arrived in Florida, Chris's mother (who is an excellent sewer and quilter) added darts to contour the screens to better fit the door, and reinforced the seams with lightweight denim to protect the more delicate mosquito netting from repeated door opening and shutting.